Of all the work I've been churning out lately, I did this piece, which incidentally was just a supplement for a comic strip piece I drew for Houstonia Magazine. It's a cool little piece in and of itself, and I scanned it during two phases of it's completion. 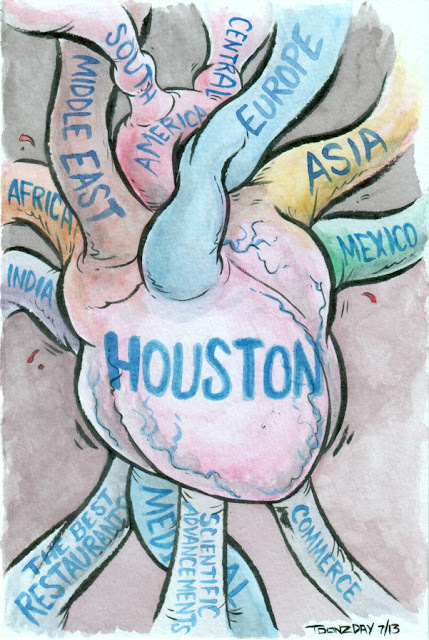 Within the comic strip, which is written by Mat Johnson, he explains how the people of the world who move to this city are the city's life blood, with Houston becoming a heart pumping. So the panel called for a heart illustration. I liked how the heart looked as is so I scanned it, here. 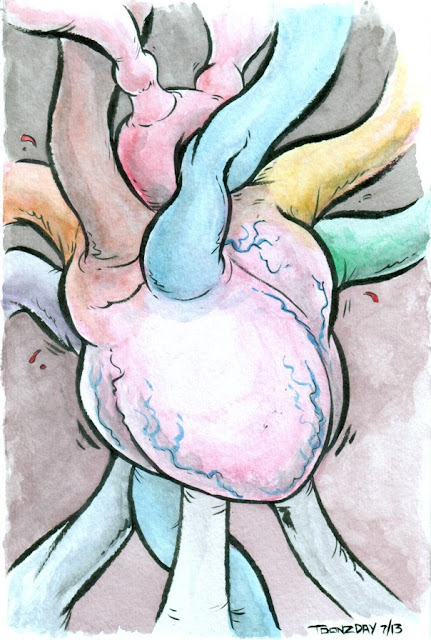 Basic heart illustration, although maybe not anatomically correct cuz I don't think hearts have so many tubes coming out in every-which-way like that. But it goes further. To drive the metaphor home we gotta label it with various places of the world, places that create people who then flock to Houston. I did this, and I was so enamored by it as a stand alone piece I had to show you, hence the subject of this post. Peep it! Or just pick up the October 2013 of Houstonia.